Not Quite Right! : Jumbuck 2 Burner Maxi Hooded Barbecue - Review! I've wanted a Barbecue for a while now and finally got around to purchasing one a couple of weeks ago, when I had the chance to get to bunnings. Yes I know the best BBQ's are of course the Webers of all models, I really do believe you, Weber BBQs rule they are the best of the best! Right, now that I have that out of the way, I couldn't afford a Weber or any expensive BBQ model or brand, still, I searched, I wanted a two burner or at least smaller patio or courtyard size rather than a full size 4-6 burner, it's only me so it will do me fine. 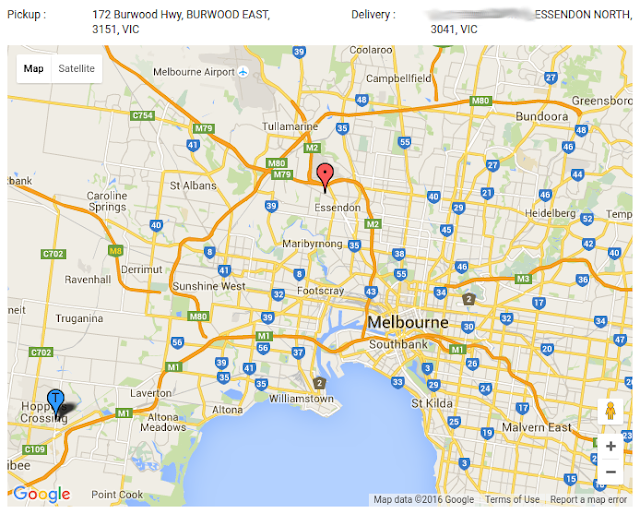 So after much searching using the trusty google I stumbled upon the Jumbuck from Bunnings. I did my research on review sites and forums and there was not a lot of info on the particular model I wanted just a few things, more so ads on gumtree with glowing descriptions of course, but nothing negative either so I took that to mean adequate at least, eg. usable to cook a BBQ of meat. It seems that Bunning's has the distributorship of Jumbuck BBQ's, I think I read that somewhere so that may not be true, anyway they had a couple of hooded type two burner BBQ's, the ones in my price range were both Jumbuck models, I bought the more expensive one as I could not find any overly negative reviews, I don't trust many of the even what seems like honest reviews as let's face it people are morons these days, no common sense, listen to idiot "mates" that know nothing but talk loud and most don't read instructions or if they do they don't understand them anyway. So without ranting too much here's the story so far! So far the Jumbuck as performed quite adequately and by that I mean definitely good enough to cook a nice Barbie, my first test was just a lamb forequarter chop, I wiped down the hotplate and ignited the hotplate side of the unit, I let it warm up a bit, about 3 mins, with the hood down of course. The first time there was of course much lifting of the hood, couldn't help myself, but in fairness it was it's maiden voyage, so I wanted to get a feel of cooking time and burner settings for continued success. The chop could have been cooked a little more for my liking but that had nothing to do with the BBQ as such, it was all my fault, lifting the lid, messing with gas settings and over excited as well I guess lol, oh the gas jet igniter is pretty darn good as well, shoots a long flame out to ignite the burners! The next meal I had was Chicken Drumsticks, always a great snack and tasty when Barbecued, these were lovely, the cooking time was right and I just let it do it's thing with the hood down on high gas setting, I turned them a few times to try and crisp all sides, but they definitely benefited from the oven effect of the Hood, which also has a temperature gauge so you can watch how hot it gets under the hood so this did impress me, it showed me that the Jumbuck 2 Burner Maxi Hooded Barbecue from Bunning's was well worth the price for me anyway, it's definitely good enough! "You don't need a big outdoor space to entertain your family and friends, with the Jumbuck 2 Burner Hooded Barbecue. Its compact design and functional features allow those with smaller outdoor areas such as patios and courtyards, to host barbecues. 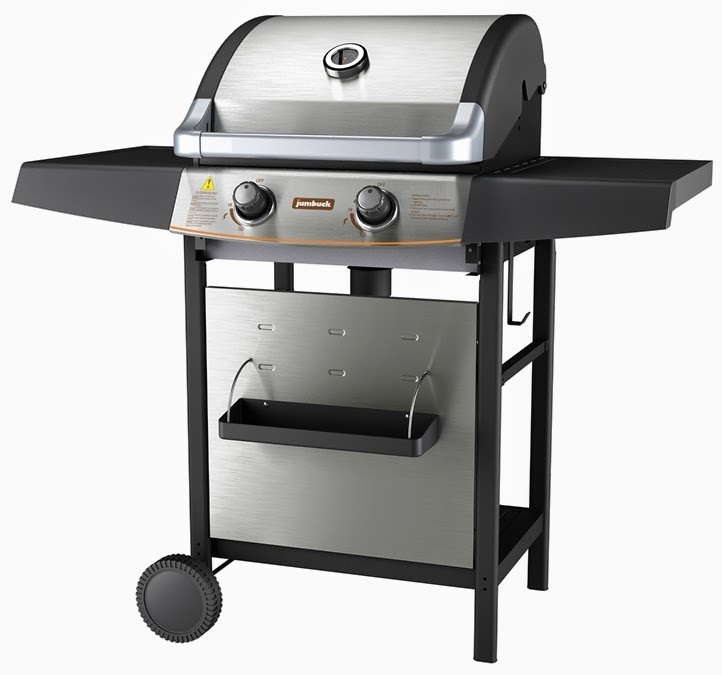 With a sleek stainless steel hinged lid and a sturdy steel frame, this 2 burner hooded barbecue features a cast iron plate and grill cooking surface. A built-in temperature gauge helps you better control heat, achieving delicious and juicy meat. It sports a handy condiment tray and wheels for greater portability".